Raleigh ( /ˈrɑːli/; RAH-lee) is the capital of the state of North Carolina as well as the seat of Wake County. Raleigh is known as the "City of Oaks" for its many oak trees, which line the streets in the heart of the city. According to the U.S. Census Bureau, the city's 2012 estimated population was 423,179, over an area of 142.8 square miles (370 km2), making Raleigh currently the 42nd most populous city in the United States. It is also one of the fastest-growing cities in the country. The city of Raleigh is named after Sir Walter Raleigh, who established the lost Roanoke Colony on Roanoke Island in present-day Dare County, North Carolina. Raleigh is home to North Carolina State University and is part of the Research Triangle area, together with Durham (home of Duke University) and Chapel Hill (home of University of North Carolina at Chapel Hill). The "Triangle" nickname originated after the 1959 creation of the Research Triangle Park, located in Durham County partway between the three cities and their universities. The Research Triangle region encompasses the U.S. Census Bureau's Raleigh-Durham-Chapel Hill Combined Statistical Area (CSA), which had an estimated population of 1,998,808 in 2012. The Raleigh Metropolitan Statistical Area (MSA) had an estimated population of 1,188,564 2012. Raleigh is home to numerous cultural, educational, and historic sites. The Progress Energy Center for the Performing Arts in Downtown Raleigh features three theater venues and serves as the home for the North Carolina Symphony. Time Warner Cable Music Pavilion is a large music amphitheater located in Southeast Raleigh. Museums in Raleigh include the North Carolina Museum of Art in West Raleigh, as well as the North Carolina Museum of History and North Carolina Museum of Natural Sciences located next to each other near the State Capitol in Downtown Raleigh. Several major universities and colleges call Raleigh home, including North Carolina State University, the largest public university in the state, and Shaw University, the first historically black university in the American South and site of the foundation of the Student Nonviolent Coordinating Committee, an important civil rights organization of the 1960s. One U.S. president, Andrew Johnson, was born in Raleigh. Bath was the first nominal capital of North Carolina, but the colony had no permanent institutions of government until their establishment in New Bern. The city's location was chosen, in part, for being within 11 mi (18 km) of Isaac Hunter's Tavern, a popular tavern frequented by the state legislators. No known city or town existed previously on the chosen city site. Raleigh is one of the few cities in the United States that was planned and built specifically to serve as a state capital. Its original boundaries were formed by the downtown streets of North, East, West and South streets. It was planned to be laid out in an axial fashion, with four public squares and one central square. After the Civil War ended in 1865, African Americans were emancipated. The Reconstruction legislature established public education for blacks and whites. The men, like whites, were admitted to the franchise of voting. Blacks had already been organizing in churches and other community-based organizations. Freedmen were often led by free blacks who had become educated before the war. With the help of the Freedmen's Bureau, many freedmen migrated from rural areas to Raleigh. It had a free black community and many freedmen wanted to get out from under white supervision in the rural areas. Raleigh, like much of the southeastern United States, has a humid subtropical climate (Köppen Cfa), with four distinct seasons. Winters are short and generally cool, with a January daily average of 41.0 °F (5.0 °C). On average, there are 69 nights per year that drop to or below freezing, and only 2.7 days that fail to rise above freezing. April is the driest month, with an average of 2.91 inches (73.9 mm) of precipitation. Summers are hot and humid, with a daily average in July of 80.0 °F (26.7 °C). There are 48 days per year with highs at or above 90 °F (32 °C). Autumn is similar to spring overall but has fewer days of rainfall. Extremes in temperature have ranged from −9 °F (−23 °C) on January 21, 1985 up to 105 °F (41 °C), most recently on July 8, 2012. Raleigh receives an average of 6.0 inches (15.2 cm) of snow in winter. Freezing rain and sleet also occur most winters, and occasionally the area experiences a major damaging ice storm. On January 24–25, 2000, Raleigh received its greatest snowfall from a single storm – 20.3 inches (52 cm) – the Winter Storm of January 2000. Storms of this magnitude are generally the result of cold air damming that affects the city due to its proximity to the Appalachian Mountains. Winter storms in the past have caused traffic problems in the past as well. Downtown (also known as "Inside the Beltline" or ITB) is home to historic neighborhoods and buildings such as the Sir Walter Raleigh Hotel built in the early 20th century, the restored City Market, the Fayetteville Street downtown business district, the Cameron Village midtown business district, which includes the PNC Plaza and Wells Fargo Capitol Center buildings, as well as the North Carolina Museum of History, North Carolina Museum of Natural Sciences, North Carolina State Capitol, Peace College, the Raleigh City Museum, Raleigh Convention Center, Shaw University, and St. Augustine's College. The neighborhoods in Old Raleigh include Cameron Park, Boylan Heights, Country Club Hills, Coley Forest, Five Points, Budleigh, Glenwood-Brooklyn, Hayes Barton Historic District, Moore Square, Mordecai, Rosengarten Park, Belvidere Park, Woodcrest, and Historic Oakwood. In the 2000s, an effort by the Downtown Raleigh Alliance was made to separate this area of the city into five smaller districts: Fayetteville Street, Moore Square, Glenwood South, Warehouse (Raleigh), and Capital District (Raleigh). Some of the names have become common place among locals such as the Warehouse, Fayetteville Street, and Glenwood South Districts. Uptown Raleigh is a residential and commercial area at the intersection of Glenwood and Creedmoor adjacent to the Beltline. Crabtree Valley Mall is the anchor of the area. This label is not used by anyone. The Soleil Center, what was to be the second tallest building in Raleigh at 480, was planned to be built here, but due to the financial Crisis of 2008 lost funding and now is stalled. This enclave is still considered to be part of North Raleigh, because in the past it was known as the outskirts of Raleigh, a very rural country land. The 27612 zip code covers much of this area. The main roads are Millbrook Road and North Hills Drive. West Raleigh lies along Hillsborough Street and Western Boulevard. The area is bordered to the west by suburban Cary. It is home to North Carolina State University, Meredith College, Pullen Park, Pullen Memorial Baptist Church, Cameron Village, Lake Johnson, the North Carolina Museum of Art and historic Saint Mary's School. Primary thoroughfares serving West Raleigh, in addition to Hillsborough Street, are Avent Ferry Road, Blue Ridge Road, and Western Boulevard. West Raleigh is also home to the nation's smallest Roman Catholic cathedral, Sacred Heart Cathedral. The PNC Arena is also located here adjacent to the North Carolina State Fairgrounds. These are located approximately 2 miles from Rex Hospital. North Raleigh is an expansive, diverse, and fast-growing suburban area of the city that is home to established neighborhoods to the south along with many newly built subdivisions and along its northern fringes. The area generally falls North of Millbrook Road. It is primarily suburban with large shopping areas. Primary neighborhoods and subdivisions in North Raleigh include Bedford, Bent Tree, Brentwood, Brier Creek, Brookhaven, Black Horse Run, Crossgate, Crosswinds, Falls River, Hidden Valley, Lake Park, North Haven, North Ridge, Oakcroft, Shannon Woods, Six Forks Station, Springdale, Stonebridge, Stone Creek, Stonehenge, Valley Estates, Wakefield, Windsor Forest, and Wood Valley. The area is served by a number of primary transportation corridors including Glenwood Avenue U.S. Route 70, Interstate 540, Wake Forest Road, Millbrook Road, Lynn Road, Six Forks Road, Spring Forest Road, Creedmoor Road, Leesville Road, Strickland Road, and North Hills Drive. Southeast Raleigh is bounded by downtown on the west, Garner on the southwest, and rural Wake County to the southeast. The area includes areas along Rock Quarry Road, Poole Road, and New Bern Avenue. Primary neighborhoods include Chavis Heights, Raleigh Country Club, Southgate, Kingwood Forest, Rochester Heights, Emerald Village and Biltmore Hills. Time Warner Cable Music Pavilion (formerly Alltel Pavilion and Walnut Creek Amphitheatre) is one of the region's major outdoor concert venues and is located on Rock Quarry Road. Shaw University is located in this part of the city. In addition, *11.3% were Hispanic or Latino American, of any race (5.9% Mexican, 1.1% Puerto Rican, 0.9% Salvadoran, 0.6% Honduran, 0.3% Cuban, 0.3% Colombian, 0.2% Guatemalan, 0.2% Peruvian). According to the Federal Bureau of Investigation's Uniform Crime Reports, in 2010 the Raleigh Police Department and other agencies in the city reported 1,740 incidents of violent crime and 12,995 incidents of property crime. Of the violent crimes reported, 14 were murders, 99 were forcible rapes and 643 were robberies. Aggravated assault accounted for 984 of the total violent crimes. Property crimes included burglaries which accounted for 3,021, larcenies for 9,104 and arson for 63 of the total number of incidents. Motor vehicle theft accounted for 870 incidents out of the total. Raleigh, NC is number three on the 2013 Forbes List for being the best place for businesses and careers. Companies based in Raleigh include BB&T Insurance Services, Capitol Broadcasting Company, Carquest, First Citizens BancShares, Golden Corral, Martin Marietta Materials, and Red Hat. Public schools in Raleigh are operated by the Wake County Public School System. Observers have praised the Wake County Public School System for its innovative efforts to maintain a socially, economically and racial balanced system by using income as a prime factor in assigning students to schools. Raleigh is home to three magnet high schools; William G. Enloe High School, Southeast Raleigh High School, and Millbrook High School. The Progress Energy Center for the Performing Arts complex houses the Raleigh Memorial Auditorium, the Fletcher Opera Theater, the Kennedy Theatre, and the Meymandi Concert Hall. In 2008, a new theatre space, the Meymandi Theatre at the Murphey School, was opened in the restored auditorium of the historic Murphey School. Theater performances are also offered at the Raleigh Little Theatre, Long View Center, Ira David Wood III Pullen Park Theatre, and Stewart and Thompson Theaters at North Carolina State University. In addition to the Hurricanes, the Carolina RailHawks FC of the North American Soccer League play in suburban Cary to the west; the Carolina Mudcats, an Single-A minor-league baseball team, play in the city's eastern suburbs; and the Durham Bulls, the AAA minor-league baseball team made internationally famous by the movie Bull Durham, play in the neighboring city of Durham. North Carolina State University is located in southwest Raleigh where the Wolfpack competes nationally in 24 intercollegiate varsity sports as an original member of the Atlantic Coast Conference. The university's football team plays in Carter-Finley Stadium, the third largest football stadium in North Carolina, while the men's basketball team shares the PNC Arena with the Carolina Hurricanes hockey club - List of sports venues in North Carolina. The Raleigh Parks and Recreation Department offers a wide variety of leisure opportunities at more than 150 sites throughout the city, which include: 8,100 acres (33 km2) of park land, 78 miles (126 km) of greenway, 22 staffed community centers, a BMX championship-caliber race track, 112 tennis courts among 25 locations, 5 public lakes, and 8 public aquatic facilities. I-495, designated in December, 2013 but currently not signed. The route will eventually connect I-440 to I-95 just east of Rocky Mount. It will be concurrent with U.S. 64 for its entire length, following the same roadway as currently exists. When signed, the segment from I-440 to I-540 will be signed as I-495, while the segment to the east of I-540 will be signed as "Future I-495". The highway is currently to Interstate standards only along the Knightdale Bypass, which runs from I-440 to the Business 64 exit between Knightdale and Wendell. East of this point, the road is a controlled access freeway, but does not meet interstate standards. The "future" designation will be removed as the road is eventually upgraded by improving the road's shoulders, which are currently too narrow to qualify for an Interstate Highway. There is no set timetable for these improvements. ^ Mark Binker (June 4, 2012). "Fact Check: Ad against McCrory lacks solid conclusion". WRAL-TV. http://www.wral.com/news/state/nccapitol/story/11168235/. Retrieved August 9, 2012. ^ Bill Leslie (November 3, 2011). "NC Pronunciation Guide". WRAL-TV. http://www.wral.com/lifestyles/travel/blogpost/10331495/. Retrieved July 18, 2013. ^ Fisher, Daniel. "America's Fastest-Growing Cities". Forbes.com. http://www.forbes.com/pictures/mlj45hfdf/6-raleigh-nc/#gallerycontent?partner=msnre. Retrieved 2012-05-14. ^ "Population Estimates 2012 Combined Statistical Areas: April 1, 2010 to July 1, 2012". U.S. Census Bureau. http://www.census.gov/popest/data/metro/totals/2012/index.html. Retrieved 2013-03-14. ^ "Raleigh Durham Annexation Agreement Lines" (PDF). http://www.raleighnc.gov/content/PlanLongRange/Documents/Maps/Raleigh_Durham_Annexation_Agreement_Lines.pdf. Retrieved 2012-01-04. ^ Bishir, Catherine (2005). North Carolina Architecture. UNC Press. p. 73. ISBN 978-0-8078-5624-6. http://books.google.com/?id=NccTgQkmPIEC. ^ "Race and Hispanic Origin for Selected Cities and Other Places: Earliest Census to 1990". U.S. Census Bureau. http://www.census.gov/population/www/documentation/twps0076/twps0076.html. Retrieved May 2, 2012. ^ a b c "NowData - NOAA Online Weather Data". National Oceanic and Atmospheric Administration. http://www.nws.noaa.gov/climate/xmacis.php?wfo=rah. Retrieved 2012-02-08. ^ "Historic Boylan Heights Neighborhood Main Page". Boylanheights.org. http://www.boylanheights.org/. Retrieved 2012-01-04. ^ Dathan Kazsuk (July 25, 2011). "Slideshow: Midtown Raleigh Alliance". Triangle Business Journal. http://www.bizjournals.com/triangle/news/2011/07/25/slideshow-midtown-ralleigh-alliance.html#storylink. Retrieved 2013-04-12. ^ Garfield, Matt (4 December 2011). "McFarlane era to begin Monday in Raleigh". Raleigh News & Observer. http://www.newsobserver.com/2011/12/04/1689653/mcfarlane-era-to-begin-monday.html. Retrieved 18 December 2011. ^ "Crime in the United States, 2010". Department of Justice — Federal Bureau of Investigation. http://www.fbi.gov/about-us/cjis/ucr/crime-in-the-u.s/2010/crime-in-the-u.s.-2010/tables/table-8/10tbl08nc.xls. Retrieved 26 December 2011. ^ "Raleigh, NC". Forbes. 2013-12-31. http://www.forbes.com/places/nc/raleigh/. Retrieved 2014-01-24. ^ "City of Raleigh CAFR" (PDF). http://www.raleighnc.gov/content/Finance/Documents/CAFRCurrentYear/26Demographics.pdf. Retrieved 2014-01-24. ^ Courtney Subramanian (2011-09-15). "America's Most Educated Cities: Madison and Boulder Face Off". Time. http://newsfeed.time.com/2011/09/15/americas-most-educated-cities-madison-and-boulder-face-off/. Retrieved 2011-10-30. ^ "ABOUT | Burning Coal Theatre Company | VENUE". Burningcoal.org. 2008-02-01. http://burningcoal.org/murphey.html. Retrieved 2012-01-04. ^ Lemberg, David (2006-09-02). "ARTSCAPE: Dr. Lawrence Wheeler, Director, North Carolina Museum of Art, 8-25-06". Artscapemedia.com. http://www.artscapemedia.com/podcasts/archives/2006/09/dr_lawrence_whe.html. Retrieved 2012-01-04. ^ "Monet Exhibit Sets New Attendance Record at N.C. Museum of Art". WRAL.com. 2007-01-15. http://www.wral.com/news/local/story/1137143/. Retrieved 2012-01-04. ^ "Raleigh Bike Polo". http://www.raleighbikepolo.com. Retrieved 23 January 2014. ^ "North Carolina Gets a New Interstate, with the I-495 Designation near Raleigh". NCDOT News Releases. North Carolina Department of Transportation. December 12, 2013. https://apps.ncdot.gov/newsreleases/details.aspx?r=9132. Retrieved 30 January 2014. ^ "The Official City of Raleigh Portal - Capital Area Transit". Raleighnc.gov. 1970-01-01. http://www.raleighnc.gov/transit. Retrieved 2012-01-04. ^ "Regional Transit Infrastructure Blueprint". Transitblueprint.org. 2008-05-21. http://www.transitblueprint.org/stac.shtml. Retrieved 2012-01-04. ^ "The Official City of Raleigh Portal". Raleighnc.gov. http://www.raleighnc.gov/portal/server.pt/gateway/PTARGS_0_2_411_208_0_43/http%3B/pt03/DIG_Web_Content/news/public/News-PubAff-Historic_Chateau_Exhibit-20081027-15185263.html. Retrieved 2012-05-18. ^ "The Official City of Raleigh Portal". Raleigh-nc.org. http://www.raleigh-nc.org/publications/Boards,_Commissions_and_Council/City_Council/1999_Minutes/CC-minutes-19991116.htm. Retrieved 2012-01-04. ^ "Sister Cities Association of Raleigh, Raleigh Sister Cities". Raleighsistercities.org. http://raleighsistercities.org/. Retrieved 2012-01-04. 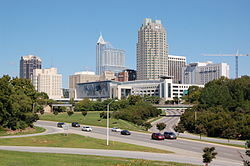 ^ "Raleigh, North Carolina". Sister Cities International. http://www.sister-cities.org/interactive-map/Raleigh,%20North%20Carolina. Retrieved 2013-01-29. ^ Wong, Venessa. "Which is America's Best City?". BloombergBusinessWeek. http://www.businessweek.com/lifestyle/which-is-americas-best-city-09202011.html. Retrieved 27 February 2013. ^ Badenhausen, Kurt. "The Best Places for Business and Careers". Forbes.com. http://www.forbes.com/sites/kurtbadenhausen/2012/06/27/the-best-places-for-business/. Retrieved 27 February 2013. ^ "The 10 Best Cities for Educated Workers". 24/7 Wall Street. http://247wallst.com/2011/09/12/the-ten-cities-with-the-most-qualified-workers/. Retrieved 27 February 2013. ^ "Oklahoma City, Nashville Ranked Most Cost-Attractive Business Locations Among Mid-Sized U.S. Cities". KPMG. http://www.kpmg.com/us/en/issuesandinsights/articlespublications/press-releases/pages/oklahoma-city-nashville-ranked-most-cost-attractive-business-locations-among-mid-sized-us-cities-kpmg-study.aspx. Retrieved 27 February 2013. ^ Marati, Jessica. "The Healthiest and Happiest Cities in the U.S.". Ecosalon.com. http://ecosalon.com/10-best-cities-in-america-for-health-and-happiness/. Retrieved 27 February 2013. ^ Bewley, Jennifer. "Fastest-Growing Cities for Technology Jobs". Dice.com. http://media.dice.com/report/fastest-growing-cities-technology-jobs/. Retrieved 27 February 2013. ^ Van Riper, Tom. "The Best Cities for Raising a Family". Forbes.com. http://www.forbes.com/sites/tomvanriper/2012/04/04/the-best-cities-for-raising-a-family/. Retrieved 27 February 2013. ^ Taylor, Kari. "The 10 Best Cities for Newlyweds". Forbes.com. http://www.forbes.com/sites/christinaaragon/2012/07/16/top-10-cities-after-you-say-i-do/. Retrieved 27 February 2013. ^ O'Malley Greenburg, Zack. "Best Places for Bargain Retirement Homes". Forbes.com. http://www.forbes.com/2011/01/10/best-places-for-bargain-retirement-homes-personal-finance.html. Retrieved 27 February 2013. ^ "Raleigh". Forbes.com. http://www.forbes.com/places/nc/raleigh/. Retrieved 27 February 2013. This page uses content from the English language Wikipedia. The original content was at Raleigh, North Carolina. The list of authors can be seen in the page history. As with this Familypedia wiki, the content of Wikipedia is available under the Creative Commons License.